How much does it weigh please? I got a 10kg kettle bell from Lidl for £7.99 on Thursday, reduced from £9.99. Pretty sure it's nationwide so worth checking out. 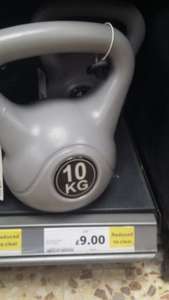 I got a 10kg kettle bell from Lidl for £7.99 on Thursday, reduced from … I got a 10kg kettle bell from Lidl for £7.99 on Thursday, reduced from £9.99. Pretty sure it's nationwide so worth checking out. good door stop though... or a paperweight! 10,000 grams or 352.74 oz.